A trio of Class III rapids and nice scenery make this Portland favorite one of the state's most frequently paddled summertime rivers. When the flows are low on other rivers this one is still pumping. From the put-in at Packsaddle Park off Highway 22, the river offers boulder-dodging and forested scenery. After passing below the Gates bridge, get ready for the most exciting stretch of river. Spencer's Hole, Class III+, requires punching through a hole by running center-right into the rapid. Just downstream comes an island and a sweeping, left-to-right drop of Carnivore, Class III. The final rapid is Mill City Falls (Class III), a large drop below Mill City Bridge. The paddle from Fishmen's Bend to North Santiam park is very nice, with easier Class II/III rapids. Our full-day trips always include our great all-you-can-eat lunch. We only schedule full-day trips for groups of 4 or more and end our trip at North Santiam park. 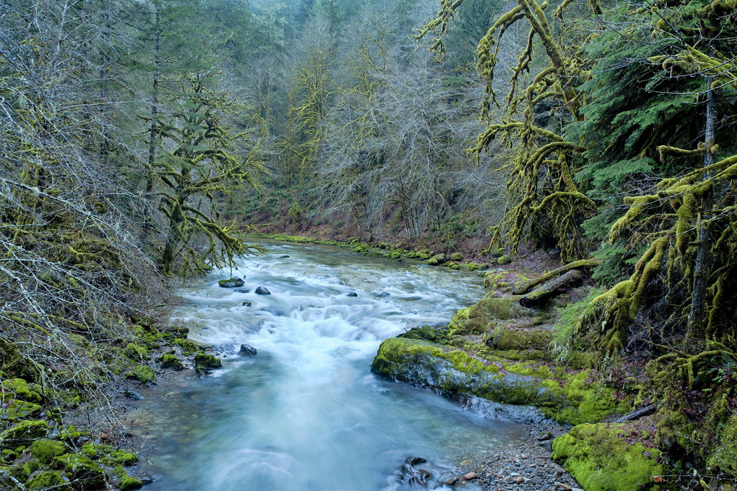 The North Santiam River is located about 25-30 miles east of Salem, Oregon. Salem is about 45 miles south of Portland. Our half-day and full-day trips meet at two different locations. Once we reserve your trip, we will send specific directions to the meeting area Some local attractions we recommend in this area include: Silver Falls State Park, The Oregon Garden, the Historic town of Silverton, Seven Brides Brewing, Opal Creek Trail, Breitenbush Hot Springs. .